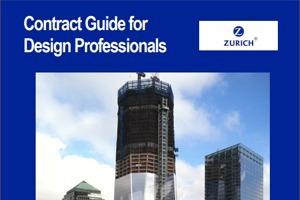 Originally published in Risk Management & Contract Guide for Design Professionals, (c) 2006 & 2014; a/e ProNet and J. Kent Holland Jr.
Indemnification clauses in contracts may require the design professional to indemnify, hold harmless, and defend its client against claims, damages, and allegations. If you agree to indemnify your client for anything other than damages arising out of your negligence in the performance of professional services, you will be contractually liable for damages that you would not have been liable for under common law. In other words, the courts would not impose liability on you since you did not violate the standard of care, yet you may be found contractually liable regardless of whether you were negligent, since that is what you agreed to by virtue of the contractual indemnification clause. Indemnity clauses may include any, or all, of three distinct obligations, including to (1) indemnify, (2) defend, and (3) hold harmless the client. Indemnify means to reimburse your client following a loss. “Defend” means to pay the client’s legal expenses as it defends itself against a third party claim. Hold harmless may have different meanings but most generally is understood to be your agreement to protect the client against harm from suits by either third parties or yourself. If you agree to defend your client, you may incur your client’s defense costs as it defends itself against a third party claim, and you may find that your insurance will not cover those costs. To the extent your obligation to pay these defense costs is based only on your contractual commitment and not common law, you carrier will likely assert that the contractual liability exclusion of the policy excludes these costs from coverage. This is important to remember. No matter how innocuous an indemnity clause may appear to you, if it requires you to defend the client for any reason, it may create uninsurable losses for you. Contractual Liability. This Policy does not apply to any damages, claims, or claim expenses based upon or arising out of liability assumed by You under any oral or written contract or agreement, including but not limited to hold harmless and indemnity agreements, agreements to defend others, and liquidated damages clauses, except that this exclusion shall not apply to a Claim where legal liability exists in the absence of such contract or agreement and arises from Your Wrongful Act or the Wrongful Act of Your subconsultants in the rendering of or failure to render Professional Services. Indemnity clauses fall into three groupings. These are commonly called broad form, intermediate form, and narrow form. Consultant shall indemnify, defend and save harmless the Client, and its officers, directors, employees and agents, from and against all liability, loss, cost or expense (including attorney’s fees) by reason of liability imposed upon the Client, arising out of or related to Consultant’s services, whether caused by or contributed to by the Client or any other party indemnified herein, unless caused by the sole negligence of the Client. By the terms of this clause, you will indemnify your client for damages arising from your acts regardless of whether those acts and omissions are negligent. By placing the word negligence after the other terms, it does not modify them but rather stands alone as a separate basis for indemnity. Notice that this clause requires you to defend the owner against claims. This type of defense obligation is barred from coverage pursuant to the contractual liability exclusion of your policy. The language also requires that you indemnify the client for mere allegations without regard to whether or not there is negligence. To trigger your indemnification obligation pursuant to this clause, there need only be a mere allegation that damages arose from your professional services. Indemnification obligations not related to negligence are not covered by your policy. Beware that the limited contractual liability coverage afforded by the typical professional liability policy is not intended by the carrier to respond to the kind of contractual obligations imposed upon you by the above-quoted contract language. You should seek to strike language requiring you to provide contractual liability coverage. If the client will not agree to strike it, then at a minimum the language should be amended to indicate that only limited contractual liability coverage is provided—meaning that your policy will contain an exclusion that provides a limited clarification of the contractual liability exclusion. Intermediate Form Indemnity also shifts much risk to the consultant but not as drastically as the broad form. It may state, for example, that the consultant will indemnify the client for all damages caused in whole or in part by the consultant. This language can be deceptively subtle. Many, if not most, courts interpret it to mean that if the consultant even slightly contributed to causing the damages, it will be required to indemnify the client for ALL of the damages, including those caused by the client’s negligence. The Architect shall indemnify and hold harmless the Owner for all damages, losses, or claims that arise as a result, in whole or in part, from the negligence, or error, omissions, or failure to perform by the Architect, his employees, his agents, or his Consultants. This is an exceptionally bad clause. It is interpreted by courts to require the design professional to indemnify the owner for 100 percent of the damages incurred by the owner even if caused only in part (e.g., less than 1%) by the design professional. This is an unreasonable term and condition. It creates uninsurable risk for the design professional. Only the damages caused by the negligence of the design professional would be covered by the insurance. Consultant shall indemnify the client for damages arising out of the performance of professional services, but only to the extent caused by the negligent acts, errors or omissions of the Consultant. Keep in mind that consultants’ professional liability policies are intended to respond only to damages caused by the negligence of the insured design professional. Exclusions in the policy generally bar coverage for contractual liability in which the consultant has assumed liability it would not have had under common law because it performed services negligently. Design Professional shall indemnify and hold harmless the Owner from any and all claims, damages, suits, and expenses caused by or arising out of the acts, omissions, errors or negligence of the Design Professional. Because negligence is placed at the end of the phrase, it stands alone and does not modify the terms acts, errors, or omissions. As a result, the design professional could be required to indemnify its client for damages arising out of even non-negligent errors and omissions. To remedy this situation, the clause could be amended to read: arising out of the negligent acts, omissions or errors of the Design Professional. The key is to place the adjective negligent in front of the balance of the words. Design Professional shall indemnify and hold harmless the Owner for all claims and damages arising out of the performance of professional services on this Project. This clause could be appropriately revised by inserting the adjective negligent in front of performance so that the revised clause reads: arising out of the negligent performance of professional services on this Project. In California, it is not enough to merely avoid including uninsurable “defend” language in the indemnification clause. What might otherwise be considered acceptable language (that only requires you to indemnify your client for damages to extent arising out of your own negligence) is not sufficient to avoid the duty the courts of California will impose on you to defend the indemnitee. In essence, if a California contract contains an indemnification agreement, the agreement will be interpreted to impose an additional obligation for the indemnitor to defend the proposed indemnitee immediately upon the tendering of the defense. See the California decisions in the case of Crawford v. Weathershield and the case of UDC-Universal Development, L.P. v. CH2M Hill. See also the California Indemnification statute, Civil Code, Sections 2772-2784.5. The only way around this, is for the parties to affirmatively state that there is NO duty to defend any claim that is subject to the indemnification provisions. Carefully review the language of the contract’s indemnity provision and remove any requirement that you defend your client in litigation. A requirement that you defend the client creates potentially uninsurable liability. In contrast to indemnification, which occurs after the fact and reimburses the client for its expenses, defense of the client requires you to expend money during the course of litigation before your liability has been determined. Revise indemnity provisions to ensure that you indemnify the client only to the extent of damages caused by your negligence or the negligence of others for whom you are legally responsible. If the indemnity provision contains the language “in whole or in part”, negotiate revised language stating that you are liable only to the extent of damages arising from your negligence. The contractual liability exclusion in the professional liability policy states that there is no coverage for liability that you assume by contract that you would not have had at common law in the absence of the contract language. In other words, if you were negligent, your insurance covers you and the contractual liability is not an issue. If, however, you were not negligent, and the basis for the client’s recovery against you is the contractual indemnification obligation, you have no coverage for that loss. Pursuant to principles of common law, the design professional is legally responsible for its negligence, including a duty to indemnify its client for damages arising out of the design professional’s negligence. A project owner, consequently, is adequately protected by common law even in the absence of any contract language specifically adding indemnification provisions. Consultant agrees to indemnify and hold harmless Client from and against any liabilities, damages, and costs arising out of the death or bodily injury to any person or the destruction or damage to any property, to the extent caused, during performance of services under this Agreement, by the negligent acts, errors and omissions of the Consultant or anyone for whom Consultant is legally responsible, subject to the limitations set forth in the Limitation of Liability article of this Agreement. EJCDC E-500 (2008 Ed.) provides at Section 6.10.D for mutual indemnification for damages arising out of negligence, and specifically limits the indemnification to the percentage share of the indemnifying party’s negligence. Percentage Share of Negligence. To the fullest extent permitted by law, a party’s total liability to the other party and anyone claiming by, through, or under the other party for any cost, loss, or damages caused in part by the negligence of the party and in part by the negligence of the other party or any other negligent entity or individual, shall not exceed the percentage share that the party’s negligence bears to the total negligence of Owner, Engineer, and all other negligent entities and individuals. Subject to the foregoing provisions, the Consultant agrees, to the fullest extent permitted by law, to indemnify and hold harmless the Client, its officers, directors, employees and agents from and against any liabilities, damages and costs (including reasonable attorneys fees and costs of defense) arising out of the death or bodily injury to any person or the destruction or damage to any property, to the extent caused, during the performance of Services under this Agreement, by the negligent acts, errors or omissions of the Consultant or anyone for whom the Consultant is legally responsible, subject to any limitations of liability contained in this Agreement. The Client agrees, to the fullest extent permitted by law, to indemnify and hold harmless the Consultant, its officers, directors, employees and agents from any liabilities, damages and costs (including reasonable attorneys fees and costs of defense) to the extent caused by the negligent acts, errors or omissions of the Client, the Client’s contractors, consultants or anyone for whom Client is legally responsible. ∙ the indemnity obligation for the Consultant is capped at whatever limitations of liability have been negotiated into the contract in other clauses. In summary, educate your client to understand that your insurance will not cover you or provide any benefits to the client for costs you agree to incur that arise out of anything other than your negligence. If you have questions about indemnification clauses, please contact us. Clauses excerpted from AIA Document B101-2007, © American Institute of Architects 2007, are reproduced with permission of the AIA. Contract clauses excerpted from the Engineers Joint Contract Documents Committee (EJCDC®) Document E-500 (2008), ©2008 National Society of Professional Engineers, American Council of Engineering Companies, American Society of Civil Engineers, and Associated General Contractors of America, are reproduced with permission of EJCDC’s copyright administrator.